Homespun Stitchworks..... For the love of vintage: Vintage Lloyd Loom chairs ...... A very comfy seat for the summer! Vintage Lloyd Loom chairs ...... A very comfy seat for the summer! This week I am going to set a little time away to stitch a personal project. 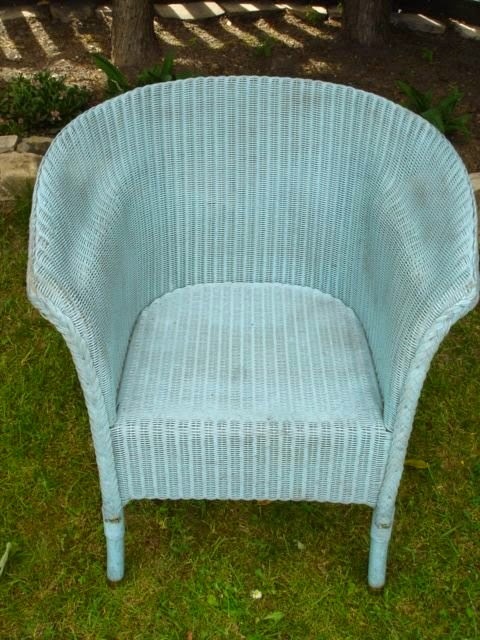 I have two vintage Lloyd Loom chairs one is painted duck egg blue and the other is a vintage cream colour. I love these chairs and am going to find some more this Spring if I can. I have a cushion in them to sit on but want to cover said cushions with a new fabric. Yes dear readers a new fabric not vintage. The reason for this is purely durability for the garden... I have been looking around and finally found some fabric that I love. Only two of the chairs will have this fabric and then I will find more fabric to blend in with the two I have. I would like 6 chairs all in all and I think three types of fabric but blended will look amazing! What do you think to this beauty. It looks like it has been painted in water colours and is all floral... When I saw it, twas love at first sight! which for purposes of washing makes life so much more easierdon,t you think? My husband did remark about possibly not having buttons on them as this could be very uncomfortable and this time I did agree ...... Although my grandmother did used to say to me Sarah beauty has it's pinch!! and I would go with that all the way but not sure our guests would agree on this occasion! I think the chairs each with a different throw over the back of it and all with comfy seat cushions will look and feel inviting to sit on. We have some friends of ours coming over in August, they are coming from New Jersey in America and I am hoping to have a good English summer that we can be proud of AND comfy vintage chairs to lounge around in before lighting the B-B-Q and sitting at our outside table.... fingers crossed for a summer like last year! 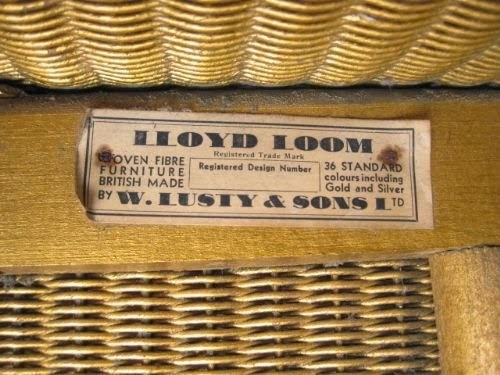 If any of you are interested in purchasing a vintage Lloyd Loom chair or two then this is the label to look out for under your chair. This way you know you are getting what you are paying for. Wish me luck and Happy Stitching! Lovely fabric and perfect summer chairs. Roll on summer evenings! Thank you Jane and 'oh yes' to summer evenings! I have two chairs and looking for 4 more. I have two fabrics and think I have found a third one to be part of the project Lloyd Loom! 6 chairs, 3 fabrics .... six throws ..... English summer comfort!